Thursday, April 25; both 1 p.m. and 6:30 p.m.
Join Tuckahoe Supervisor Pat O'Bannon and Tim Barham - GRTC Chief of Transit - as he discusses CARE On-Demand taxi and bus service. Also, Sara Morris - Henrico's NEW Advocate for the Aging - will share information to help folks age-in-place. Go to YouTube.com and search for: Henrico County Government and Tuckahoe Town Meeting. For more information or to get on the notification list, call 804-501-4208. The Henrico County App makes it easy to engage with and get information about Henrico's government. You can check upcoming events and recent news, receive important notices, find information on parks and government locations, and contact departments and agencies. The mobile app is available for both Android and IOS devices, at the Apple App and Google Play stores. Learn more here - https://youtu.be/lPBYbnRrb1g. Information also is available at https://henrico.us/apps/. Over the past four years, there have been complaints from residents who live in the River Road corridor concerning dropped calls on standard, wired AND wireless phones. Cell phone users should contact the Federal Communications Commission (FCC), since more than one company is dropping calls. Verizon seemed to be the biggest "dropper". The Federal Communications Commission has received sufficient complaints at this time to make a response. Verizon says : "If your cell service is unreliable, dial *611 from your cell phone and make a complaint. If you cannot make a call from your cell phone, dial 1-800-922-0204 from another phone." What is the Henrico County Community Emergency Notification System? This system is one of many tools that Henrico County Public Safety officials use to notify you of critical information from evacuation notices to missing child alerts. Henrico County is using the CodeRED high-speed notification solution. This system provides Henrico County public safety officials the ability to quickly deliver messages both to targeted areas of the County and/or to the entire county. How do I sign up? Visit www.henricoalert.org and complete the online registration form. This portal will register your home phone number, mobile devices (cell phones, text devices), and your work phone number (should you choose to add that information) on the system. It does not matter where you reside for text-messages. It is open to anyone who would like to register, regardless of residency. There is no cost to you from Henrico County for the system, but your cell provider may charge you for text messages. Once you register, you can test your email and cell phone in the system to make sure your information is working, or you can contact Henrico's Office of Emergency Management at 501-7183 or email emergencymanager@henrico.us for assistance. I have some other questions. Where can I get information? Henrico invites you to visit the Division of Fire’s web page at www.henricofire.org for more information on the system. You will see the icon for CodeRED on the right side of the page. Or, you can call Henrico's Office of Emergency Management at 804-501-7183 or email emergencymanager@henrico.us for more information. The National Association of Counties (NACo) recently announced that Henrico County earned 28 Achievement Awards for innovative programs, and NACo also recognized two programs in NACo's new category, 100 Brilliant Ideas at Work. Henrico County won the most awards of any county in Virginia for the 12th consecutive year and the seventh-most nationally. The County Manager's Office received an Achievement Award and one 100 Brilliant Ideas at Work honor for an initiative to offer Virtual Town Hall Meetings. The effort, lead by Board of Supervisors Chairman Patricia O'Bannon, Tuckahoe Magisterial District, allows residents to watch and to participate in public meetings via a live stream over the Internet that includes a method for home-viewers to ask questions, live. As Pat O'Bannon said, "Residents can stay at home in their pajamas, watch the Town Hall Meeting, and participate through emails -- to have their questions answered. This makes it extra easy to participate in the Civic process. Residents don't even need to drive to the site of the meeting to talk with their elected representative." O'Bannon added: "Yes, it was my idea. However, the Manager's Office IT specialist, Cari Tretina, made it happen. Ms. Tretina worked hard to establish and coordinate the telecommunications needed -- and we did it all for virtually no added costs, with programs that are readily available through YouTube and Google. Any county and any organization can replicate this with an Internet connection and a computer with a camera. That's why it was considered 'brilliant'." For more information about Virtual Town Hall Meetings, call (804) 501-4208. Want to know MORE about the Opioid epidemic, and How to Talk to your Children? Operation Prevention (www.operationprevention.com) - partnership between the DEA and Discovery Education. It's an educational program for middle and high school classrooms that aims to educate students, using science, about the impact of drugs. Your Homeowner's Insurance Rate may have decreased! Economic Development Authority Member, Benjamin Miles. Recently, Henrico County participated in a fire protection classification survey conducted by the Insurance Services Office (ISO). ISO is a private corporation that evaluates public fire protection, water supply, 911 communications, and the adoption of building codes in communities. They provide the information to insurance companies that use the data to establish property insurance premiums. Due to Henrico's work and investments in recent years, the county's rating has improved. It is now the best rating available, nationally. Of the 47,000 communities evaluated in the USA, only 97 have received this rating. Others in Virginia are Fairfax County, Roanoke City and the City of Charlottesville. 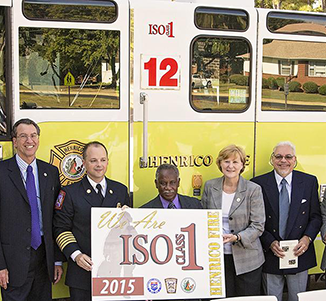 Henrico County is the only county in the nation with both an accredited fire department and a Class 1 ISO rating. This rating may result in decreased insurance premiums for residential and business property owners after November 1, 2015. In order for current residents and business owners to take advantage of this rating change, you should contact your insurance carrier. Henrico residents voted "yes" to the 2005 Bond Referendum in order to build more fire stations. This vote made a major difference in the response time for Fire and Emergency Medical Services, maning residents' vote on the Bond Referendum helped reduce their insurance rate. How do I learn about the zoning process? Where can I find information about proffers on past zoning cases? My neighbor won't cut his grass... My neighbor has an inoperable vehicle in the front yard... Who do I call for help with Community Maintenance? What is the Dillon Rule and how does it impact the way the county is run? Where is the county's animal shelter? Where or how do I register to vote? How do I get help with a problem of Domestic Violence? How do I start a business in Henrico County, Virginia? Henrico County is urging disabled veterans who own their principal residence in the county to apply for recently implemented real estate tax exemption. Virginia voters adopted a constitutional amendment in the general election directing the General Assembly to provide a tax exemption for a retired service person with 100 percent service-related, permanent and total disability, as determined by the U.S. Department of Veterans Affairs. The exemption applies to: principal residence and up to 10 acres; veteran or surviving spouse (if the veteran's death occurs on or after Jan. 1, 2011); and does not require re-filing each year. Unlike Henrico's Real Estate Advantage Program (REAP), there are no income or financial requirements for disabled veterans seeking the tax exemption. In addition, there is no cap on the amount of relief you will receive. For more information, contact Henrico's Revenue Division at 501-4263, or log onto www.co.henrico.va.us/finance and follow the link for "Disabled Veterans Real Estate Tax Exemption." Save Money! Time to Reinvest in your property - for a tax credit! Reinvest (Residential Investment Tax Abatement) is a partial tax-exemption program designed to encourage improvements and rehabilitation of qualifying homes -- those 40 years and older with an assessed value of $200,000 or less. This is a program open to all owners of residential property, both investment properties or your primary residence (excluding multi-family rental units). The program is designed to protect and preserve mature, settled neighborhoods. By improving the appearance of the properties, Henrico County will continue to be an appealing place in which future homeowners will invest! To qualify, any improvement, renovation or addition must increase the base value of the structure by a minimum of 20 percent, and may not increase the square footage of the structure by more than 100 percent. Renovations on eligible homes are not taxed for seven years -- including additions and similar projects that meet program criteria. This means that when assessing your home for real estate tax purposes, the county will not tax your home improvement, even though it will increase the assessed value of the total structure. The homeowner will pay real estate taxes only on the base value of the residence, for seven years. There is a one-time, non-refundable $50 processing fee that must accompany your application. You can download the application from Henrico County's Finance Department Web site at www.co.henrico.va.us/departments/finance and click on "Reinvest: Residential Rehabilitation Tax Credit," or call 501-4217 - Tom Little - for more information.